This travel post is written by Jasmine who blogs at Scissors Paper Stone. She travelled to San Francisco with her petite travellers, K (4 years) and J (7 years) in June 2013 to attend her sister's wedding. Her husband was unable to make it due to work commitments but thankfully, her dad and mum lent her an extra hand during the trip. This holiday is suitable for families who enjoy learning how things are made or exploring some of the world's best museums for kids. Of the American cities I have visited, San Francisco might very well be the favourite. The sunny weather, picturesque Golden Gate Bridge coupled with the buzzing activity on the Pier made me want to stay a little longer than I had planned. The food was excellent and there were lots for the kids to do. You might already have the Alcatraz and Golden Gate Bridge on your travel itinerary. But how about adding some kid-friendly options? Perhaps you might want to add a tour of a factory or a museum to your plan. Factory tours while on holiday? You heard me right. I find it fascinating to go behind the scenes to see how things are actually made. My kids are naturally curious too, so they thoroughly enjoyed these tours. If you have girls or boys who love stickers, you will probably know Mrs Grossman. At her factory, guests are shown how stickers are printed, die-cut and perforated. FREE stickers are dished out at each stop of the tour, which served to put smiles on the kids' faces. Then, right at the end you get to participate in a unique sticker project. The tour takes about 50 minutes and is available from Mondays to Thursdays. Another tour in Petaluma suitable for kids is the Mc Clelland's Dairy Farm Tours where guests can get to pet a baby calf or even milk a cow. When hungry, drop by the Petaluma Pie Company for their sweet and savoury pies or check out the other restaurants in town. You can also patronise the nice shops in the vicinity. One good shop to visit is Powell's Sweet Shoppe, where you can buy an old-fashioned candy from a past era. Ever tried a Jelly Belly? What's your favourite? Mine is Pina Colada. They come in 150 flavours! Whenever we are on a road trip, I would bring a bag of Jelly Bellies along. So when my friend mentioned the Jelly Belly Factory Tour, I knew I had to plan it into our itinerary. The tour is 40 minutes long and you tour a real factory. It was fascinating to see the rotating drums where the Jelly Bellies took shape. We were given different flavours to try as the guide explained the process to us. You can only imagine how it kept the kids quiet and attentive during the tour. Ha! Also, right at the end of the tour, all guests were invited to try free samples of any flavour. Of course, my kids couldn't resist trying the weird Harry Potter flavours. The tours run on weekdays but do check the website for up-to-date timings. After the Jelly Belly Factory Tour, we headed to the factory outlets. I love Marshall's for its great bargains and if you are ever in need of an extra luggage bag, you know you can often find one there for a steal. Third on the list is Heath Ceramics that is known for modern ceramic ware. Simple and timeless, you can find discounted second quality pieces here. I love their stuff and am so glad that I managed to visit the factory. The tours run on Fridays, Saturdays and Sundays and are suitable for kids above the age of 5. It's a great place for kids to view how lumps of clay are transformed into plates, bowls and vases. Check out the timings here. Even if you aren't keen to visit Heath Ceramics, I would recommend a day trip to Sausalito which is a gorgeous little town with quaint shops to wander into. Try to arrive in the morning and stop by Philz Coffee for their famed mint mojito iced coffees and croissants. I love the fresh smell and taste of mint so the coffee left a strong impression on me. I tried reproducing it at home once but wasn't too successful. Maybe I should try again. 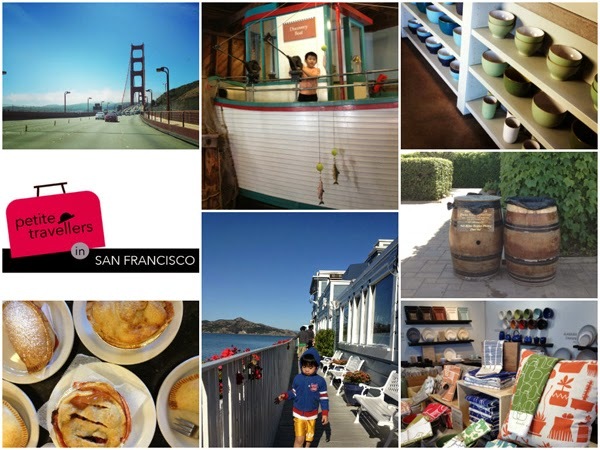 Another restaurant to visit in Sausalito is Fish (see the Sausalito picture above). It is famous for their fish and chips as well as their crab rolls and clam chowder. We chose a table outdoors and enjoyed the sun and sea breeze while happily filling our tummies. The prices are on the high side but the fish and chips didn't disappoint and unsurprisingly the kids kept asking for more. Bay Hall. This contained a miniature version of Fisherman's Wharf for the kids to engage in pretend play. My kids took turns pretending to be fishermen catching fish with a rod. We were also captivated by the trains that scooted around the hall. Wave Workshop. Inside here was a water play area where kids could build boats and float it down the river. This was water play with a purpose! I constructed boats and pitted mine against theirs. Suffice to say, we all ended up getting a bit wet. All in the name of great fun! Lookout Cove. Make sure to carve out time to visit this thoughtful outdoor play area with climbing structures, outdoor sand pits and construction toys. It sure helps that you also get a great view of the Golden Gate Bridge from there. They are open daily from 9am - 5pm. 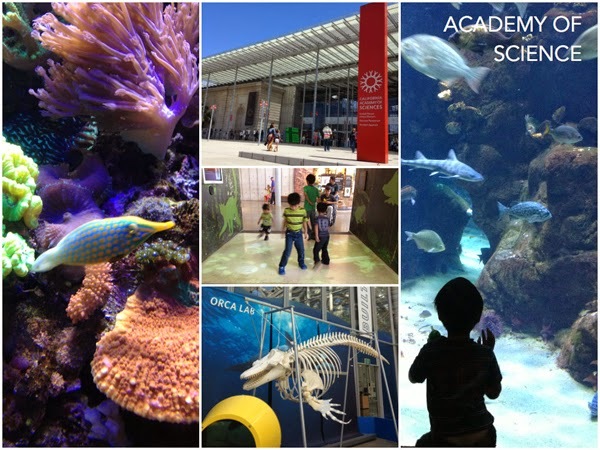 We had a great time exploring the Academy of Science which was made up of a Rainforest, Natural History Museum, Planetarium and an Aquarium. Passes to the Planetarium show are distributed on a first come, first serve basis so head straight to the Planetarium first when you arrive to pick up your tickets. We watched a show called Fragile Planet. Unfortunately, this was a little bit disappointing (I thought it was too simple). Apparently there is a new show called Dark Universe which has had better reviews. It was surreal having birds and butterflies roaming freely around us in the Rainforest exhibit We spent most of our time in the Steinhart Aquarium where there were daily penguin feedings and coral reef. The kids also ventured into the Shake House which was a room that simulated the city's two biggest earthquakes. My kids had actually experienced a real-life earthquake previously when we were in Tokyo, so this simulated version didn't really scare them. That said, this experience might not be suitable for every child so do use your own discretion as to whether you let them go on it or not. The Exploratorium wins hands down when it comes to fun for adults. Located on Pier 15, this is near the Ferry Building where you can also find lots of good eats. Unlike most museums that prefer you to keep your hands off the exhibits, here kids and adults are encouraged to tinker and explore. There are 6 main galleries : Human Phenomena, Tinkering, Seeing and Listening, Living Systems, Landscape Observation, Place and Environment and these are all located on one floor. Here is a map of the place if you want to plan ahead. Adults and kids are invited to play with light in unusual ways, observe coloured shadows, experiment with black sand, analyse how sound reacts in various situations, just to name a few of the experiences available. My kids ran from exhibit to exhibit trying to figure out how they worked. Sometimes they needed a little help and at other times, they worked it out all on their own. It truly felt like a big playground where we could all play together. I can't stress this enough: you won't want to miss the chance to visit the Exploratorium while you are in town. 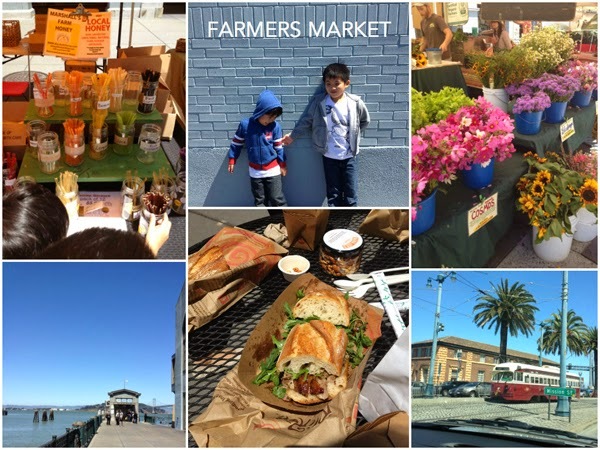 If you plan to visit the Exploratorium, you might want to have lunch at the Farmers Market at the Ferry Building which is open 3 days a week. If the Market isn't open, I suggest you head inside the building where you can treat yourself to the sweet pastries at Miette and grab a coffee from the Blue Bottle Coffee Co, and all while resting your feet. Further along the pier is Fisherman's Wharf on Pier 39, which is touristy but still a lot of fun. There are plenty of restaurants there and a charming carousel that the kids will definitely love. The last museum on the list is one that we didn't visit. It is most definitely on our list for our next holiday here. Centred on art and technology, the museum is all about inspiring kids to create from their imagination. There is an animation studio where kids are introduced to the basics of stop motion animation. A design studio where families can experiment with Adobe Photoshop as well as a music studio where kids get to perform in front of a green screen or create their own original work using GarageBand. There is also an Imagination Lab, an Innovation Lab and much more. I really wish we had something just like this in Singapore. If so, I would definitely visit it more than once with the kids. Well, that wraps up my post on kid-friendly factory tours and museums. If you have been to San Francisco, where would you recommend for family fun? Perhaps you have a favourite family restaurant that you would also want to share with us? I hope to hear from you!